Best New Chef Michael Gallina of Vicia in St. Louis has a way with vegetables, and this time of year tomatoes are his muse. 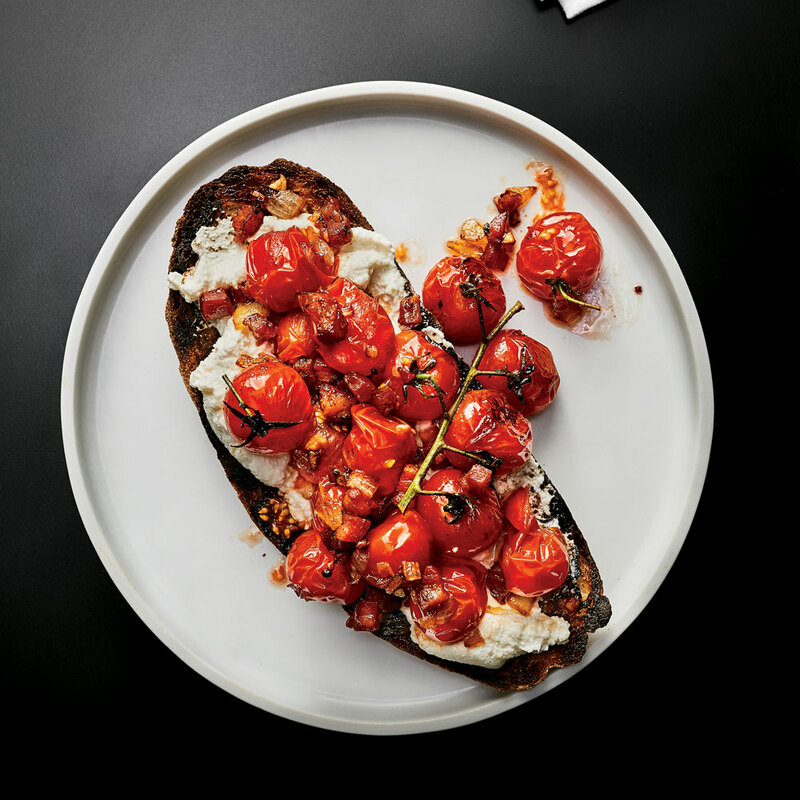 His Burst Cherry Tomatoes and Pancetta is a simple sauté that brings everything to the table: sweet acidity from the tomatoes; a salty, savory chew from the pancetta; and aromatics from the garlic and onion. The pancetta seasons the mixture, which begs to be served over ricotta toast. You can also try the combo tossed with pasta. Cook pancetta in a large skillet over medium, stirring occasionally, until fat is rendered, 8 to 10 minutes. Add onion, garlic, and 1/4 teaspoon salt, and cook, stirring often, until onion is translucent, about 5 minutes. Add tomatoes and remaining 1/4 teaspoon salt, and cook, tossing mixture and shaking skillet to coat tomatoes in pancetta fat, until tomatoes burst, about 8 minutes. Cook, gently shaking skillet, until juices and fat emulsify. Season to taste with salt. Spread toast with ricotta, and top with tomato mixture. Serve immediately. Review Body: Delicious recipe! Great as an appetizer or dinner with a side salad. Trying it tonight as a sauce! Keep recipe as is, no modifications required. Review Body: Unless they’re very VERY well cooked, the tomatoes don’t stay on the bread, especially not when you take a bite. And as enticing as the image is, I realized (too late) they’re going for style not edibility when you notice that the stems are still all on the tomatoes! Yet the flavor combination is great, and I’m re-trying tonight with adjustments for actually enjoying eating it. Review Body: This is a delicious summer appetizer with fresh garden tomatoes. I wouldn't make any changes to the recipe. It's perfect as is.